One of the best features of 'proper' roguelikes that few games ever bother to nick is their ridiculous scope for simulation and experimentation. 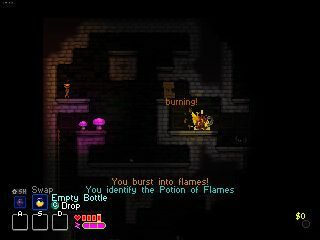 Sure, it's easier to simulate drenching, burning, clever potion combinations and so on when it's simply a matter of rendering different ascii symbols and text, but it's still a shame to see so many modern 'roguelites' focus on procedural generation and permadeath to the exclusion of all else that makes the classic roguelikes sing. Spelunky is one of the few to get simulation and experimentation right, as is Vagante to an extent—and now Catacomb Kids has come along to join the club. FourbitFriday's game goes beyond Spelunky's hard rules and consistency to offer an insanely simulated world that richly rewards player experimentation and creativity. It's in Early Access now (and a bit cheaper on Humble Bundle), and you've probably already watched the new trailer, above. There's not a lot to the Early Access version at the moment—one environment, local co-op, a couple of mini-bosses and two character classes—but there's already scope for a great deal of experimentation. Create a poisoned pool of water, set fire to yourself and others, cook food, create steam, eat bodies and use blob parts to climb up sheer walls. You get the idea, and you'll get more if you peruse the Steam reviews. This creative approach to exploration and enemy engagement is supported by satisfying, Dark Soulsy melee combat, and an insanely high difficulty level—I've played for about 40 minutes, across nearly ten characters, and I haven't yet escaped from the first floor. Catacomb Kids will be in Early Access "until it's complete", and the developers say there will be "a regular, continuous stream of updates with a new build at least once every month or so". "The full version will have four primary environments, two major bosses, at least eight mini-bosses, dozens more skills and abilities, and a metric f-ton of secrets. The finished game will also include various game modes including The Gauntlet, Co-op Mode, and Infinite Mode." There's a slightly glitchy tutorial and a two-player Versus mode in there at the moment, in addition the main rogueliking mode.